JG Thirlwell | Manorexia t-shirt and tote bag available now! 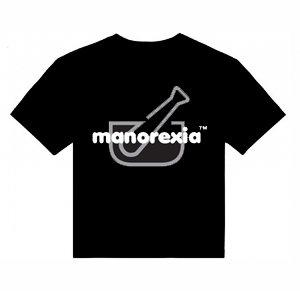 Ectopic Ents is proud to announce the release of the Manorexia t-shirt. Celebrating JG Thirlwell’s acclaimed instrumental project, the Manorexia shirt has a two color design, with white lettering on a gray mortar and pestle, making it a perfect conversation starter for your next cocktail party or doctor visit. It is printed on a black Canvas brand soft cotton shirt, and is available in small, medium, large, XL, XXL and XXXL. 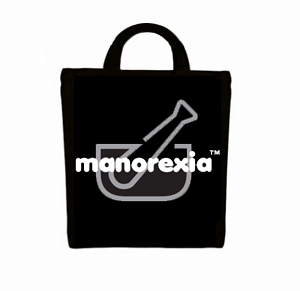 Also available is the Manorexia tote bag, The handsome cotton tote bag features the Manorexia logo in white with a half-tone mortar and pestle on a black bag and is the perfect size for carrying vinyl, or anything else your heart desires. JG Thirlwell encourages you to use your tote instead of getting plastic shopping bags at your grocery store!